ANN ALFORD rare sister funk!! 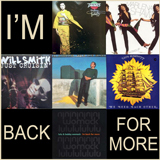 A side:"Got to Get Me a Job" & B side:"If It Ain't One Thing (It's Another)". 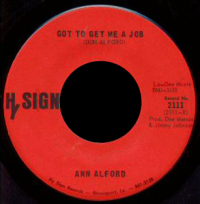 Soul vocalist Ann Alford made just one single, which came out on the Shreveport, LA, Hy-Sign label in 1972 . hard to find in Promo copy ( label blanc ). c'est de la pure soul!!!!!!!!!!!!!!!!!!!!!!!!!!!!100%%%%%%%%%%%%%!!!!!!!!!!!!!!!!!!!!!! !j'adore ca!!!!!!!!!!!!!!!! !